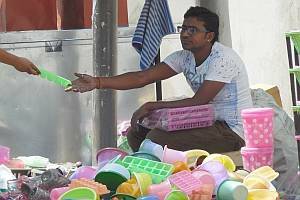 The lack of alternatives to plastic for packing goods sold at stores across Maharashtra have led to the first major backtracking move by the State government which has relaxed the ban on plastics for general and grocery stores. Several shopkeeper associations had approached Maharashtra’s Environment Minister Ramdas Kadam and complained about the situation. The relaxation is perceived as the beginning of the end for the plastic ban in Maharashtra. Oddly, while the ban on plastic for packaging for general and grocery stores has been relaxed for shopkeepers, the “ban on the use of plastic by public continues,” underlining, once again, yet another inequity in the law that will add to the list of legal discrepancies. With the government succumbing to trader pressures today, it’s a matter of time before the State government buckles before the powerful plastic manufacturers’ lobby and permits further relaxations risking thwarting the very ban it set out to implement. Often, it’s in the law itself that lies its very nemesis. For any law to be constitutionally sound and, concurrently, viable, it needs to be just. The most recent ban on plastic adopted through a notification issued on March 23, 2018 under a 2006 State law – Maharashtra Non-Biodegradable Garbage (Control) Act – is ambiguous to say the least. The State government’s submissiveness to powerful interest groups and the inherent discretions and arbitrary treatment of the law undercuts the well-meaning ban on plastic. Besides being prima facie mala-fide owing to its hasty implementation, the law penalises the citizen and loads the legal system should one decide to question the decision or reject the charge. A first-time offence fetches a fine up to Rs 5,000 which increases to Rs 10,000 for a second offence. A third offence invites a fine of Rs 25,000 with imprisonment up to three months. That apart, the fine levied is independent of the severity of the offence. So, carrying a single plastic bag fetches the same punishment as one transporting a truck filled with plastic bags from one state to another. The law does not provide for a difference in penalty for an offending person and a law-breaking corporation. The imposition of such huge fines for the common man may only trigger a surge in attempts to ‘settle’ matters by paying off bribes to the checking officials. Disputing a charge will entail appearing before a magistrate. Now, while courts are already burdened with caseloads, introducing plastic ban cases will overwhelm the system. The cases can be settled with a payment of a fine for the first two offences while the third requires a court to intervene. Failure to possess means to defend themselves legally will force many to pay up irrespective of their guilt. And, concurrently, those with the means to legally challenge the claim will engage lawyers and contest the charges. Even before the ban was implemented, certain groups felt targeted while well-organised groups lobbied their way out of the law’s ambit. Under the law, while, speciality plastic is permitted for milk and agricultural purchases, oddly no plastic is permitted for fish or meat or other dairy products. While recyclable plastic is permitted for wrapping manufactured products or where it is ‘integral to manufacture’, the law does not clarify what industries it would exempt. Plastic is permitted in special economic zones and export-oriented facilities yet banned for manufacturers and traders engaging in inter-state and international trade. Also, while plastic packaging for medicines is exempted, the government is now backtracking on absolute bans on PET bottles of less than 0.5 litres and thermocol decorations. Following a meeting with plastic manufacturers, the government passed a notification to undo the ban on bottles less than 0.5 litres. Also, on thermocol, the state’s environment department has stated the ban on thermocol decorations may be relaxed for the Ganesh festival in September. The anomalies and unsubstantiated discrepancies are bad in law and are violative of Article 14 of the Indian Constitution. Action taken by a state in undue haste may be held to be ‘Mala-fide’ and concurrently struck down. This was laid down by the Supreme Court in Inderpreet Singh Kahlon vs State of Punjab. Concurrently, owing to ‘Arbitrary Action’ and ‘Discretion’, any legislation which gives a wide power to the executive to select cases for special treatment, without indicating the policy, may be set aside as violative of equality. This was laid down by the Supreme Court in State of West Bengal vs Anwar Ali. The law on plastic ban is thwarted by the textual inconsistency. While, in some places, it is painstakingly detailed, at others, it is callously casual. The notification relating to ‘manufacture, usage, transport, distribution, wholesale & retail sale and storage, import’ is broadly applicable to all public places in the state and to all individuals and companies. Plastic bags, disposable plastic and thermocol products are covered by the notification which includes single-use plastic containers and cutlery, plastic wrapping and liquid containers. However, the definition ambiguously and abruptly ends with the term ‘etc.’, empowering those enforcing the law with limitless discretion and concurrent endless powers. The ban on plastic in regions across India and the world have been largely ineffective for various reasons. The lack of enforcement and unavailability of viable alternatives to plastic have been the major stumbling blocks. For California, for instance, a legal ban on plastic became ‘effective’ in 2015 but only after preparations for a good nine years when it passed a legislation in 2006 requiring retailers to ‘adopt a store’, recycling and other programmes. The state laid down multi-pronged strategies for alternative to plastic ban and ensured strict enforcement with fines upto $1,000 a day for violations. And, after all of this the benefits of the ban began to show! In San Jose, there was a 76 per cent decrease in litter reduction by the end of 2016; a 69 per cent reduction of plastic bags in storm-water drains, a 43 per cent increase in consumers using reusable bags and a 30 per cent increase in consumers carrying items without a bag since before the ban. The ban wasn’t fully successful. Yet there were positive indications of change. There are hurdles but they don’t seem as unsurmountable. For one, the California Legislature failed to pass a ban on polystyrene take-out containers. And, California remains the only state to have successfully implemented the ban on plastic in the United States. Also, the context and the reach of the law must be taken into consideration to put things in perspective. The law on plastics enforced by California reaches out to 3.95 crore people while the law on the same back in a state in India, say, Uttar Pradesh, reaches out to 22.11 crore people! The problems of reach, education, implementation and success have to be measured against the realistic quantum of the issue in question. Failing this, the entire exercise risks being reduced to a farce. So, in the face of gargantuan numbers, the time taken to implement the ban is evidently too little and hence reduces the efficacy of the very law. Besides the haste in implementation, that makes it mala-fide, is the selective discrepancy of the reach of the law to niche powerful groups who manage to dodge it. It may be noted here, that the success of a ban on plastics is directly related to the fact that not all types of plastic bags were included in the ban. Also, the provision, availability and viability of alternatives play a vital role. Look at Sikkim, for instance. A ban on plastic introduced in June 1998 has been considered relatively successful. A study revealed that two third of the shops in Sikkim use paper bags or newspaper and around a third use plastic bags. More people used paper bags here than in most Indian states. In Gangtok, people using paper-based bags is 62 per cent, whereas in Soreng it is 50 per cent. Apparently, plastic bag packaging is used 18 per cent lesser in towns than villages owing probably to the higher levels of inspection and therefore risk of getting caught. Concurrently, lessons weren’t learnt by the failure of the plastic ban in Delhi. In January 2009, the Delhi government ordered a complete ban on the use of all plastic bags in market areas and then, in October 2012, the Delhi government ordered a blanket ban on all types of plastic bags. However, non-woven plastic bags were surprisingly exempt from the ban. The ban failed owing to absolutely no clear effort from the government to educate, initiate or even enforce the ban in the right spirit at the grassroot level. For a plastic ban to be a success, the ingredients include enforcement, alternatives, black market, loopholes and collection/disposal. Owing to ineffective enforcement of the law, compliance is hugely reduced if not fully eliminated. A single rule will not work across the world. In India, it’s nearly impossible to monitor the plastic bag usage of small temporary independent vendors whose numbers are huge and very fluid. It is relatively easier to monitor large businesses and punish them for non-compliance. Corporations may display some sense of corporate social responsibility; even a global brand in order to maintain an image across Industry, yet a small trader or first-time vendor may not comply. Incidentally, Maharashtra is India’s biggest generator of plastic waste producing more than 4.6 lakh tonnes of waste every year. The ban on plastic, when announced, was perceived as a tough political move that would face resistance but be supported across quarters. For greater good. Yet, once the ban was announced, the cash-rich industry started lobbying to get the government to change its stance. Stories began to appear within the media on the ‘loss of jobs’ owing to the decision and fears of the economic impact on Maharashtra. While on the face of things, the industry assured a slew of recycling initiatives; it pooled in its collective force to highlight how ‘ecologically harmful’ the ban would be, as it would lead to ‘more usage of paper’ and, the ‘wastage of food’. Buckling under pressure, the government exempted companies using plastic packaging for food products, bread and milk. Next, the PET bottles used for mineral drinking water were exempted. And within days of the ban on plastic, retail packaging of not less than 250 gm was permitted for small-time general and grocery stores. Incidentally, in all, a total of 18 states in India have announced a complete ban on the manufacture, supply and storage of polythene bags and other plastic items such as cups, plates, spoons and glasses while five states have a partial ban such as one on sales, etc. So, of the 36 states and union territories in the country, 23 have banned plastic in some way or the other! And yet, the scourge of plastic pollution is on the rise quashing the myth that a ban of any sort works. Besides a powerful industry that is swift to lobby and, with all force, against such a measure, creating hindrance both at the administrative level and the executive is an Opposition, ready to highlight hurdles and play the Devil’s advocate at the drop of a hat. Today, plastic plays an intrinsic role in our lives right from its use in disposal of soiled diapers, to toothbrushes, cars even smart phones. The process towards achieving success in such a ban is surely arduous yet not impossible. It needs political resolve. Now, that is a different issue altogether.